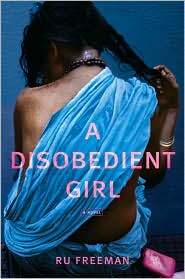 Ru Freeman‘s debut novel A Disobedient Girl chronicles the trials and travails of two Sri Lankan women and their pursuit of freedom. Ursula Hegi (Stones from the River) calls it “Evocative and moving. Ru Freeman is a marvelous storyteller who sees deeply into the complex layers of compassion and love, of sorrow and betrayal. An amazing first novel.” Ru’s creative and political writing has appeared internationally, and A Disobedient Girl will be published in translation in Italy, Israel, Taiwan, Brazil and the Netherlands. Ru blogs on her official site, rufreeman.com. When I’m not writing fiction or literary non-fiction, I’m usually writing about political events, which is not the same as being A Writer in my opinion. It is difficult for me to disengage from the world, so I’d be involved in politics one way or another, full time rather than as I do now, part time. I’d be writing about it, campaigning for a political outcome I favor, or advocating for people or causes I feel strongly about. I thrive in public settings and among strangers, so any kind of political work would be interesting to me. And more dancing, too, which I can only do on the side right now. I think this question has to take into consideration what I could write, in terms of an understanding of certain kinds of events or places or predicaments, so I’d say A Fine Balance, by Rohinton Mistry. I have admired him for a long time, and he accomplished a great deal in that book in terms of portraying a place and a system of injustice but in ways that made the reader to transcend both of those things to reach the humanity of his characters. Very different to books like Kiran Desai’s Inheritance of Loss and the Hollywoodization of places, like in Slumdog Millionaire. If there is a book I still aspire to write and perhaps feel is possible, down the line, it would be Cracking India by Bapsi Sidhwa, except with regard to Sri Lanka. It would take many years, a tremendous amount of research and serious commitment, but that’s an aspiration. What are the websites you couldn’t live without? Oh. God. To be completely honest, I’d be very unhappy – sedentary as I am so much of the time in front of a computer! – if Facebook were to end. But there are so many I visit on a regular basis both the political ones and the literary ones that I feel I need. In terms of the latter, it is not only the review-based ones but the blogs of my writer friends; Alex Chee, Laila Lalami, writers who combine politics with their creative work for instance, I would be deeply disturbed if they stopped posting. I’m thick in the middle of book promotion stuff. In between I’m trying to revise a non-fiction essay on being an immigrant for a terrific literary journal, and getting back to my second book which is supposed to be done in a few months. That is also set in Sri Lanka, and working toward that Sidwa book I mentioned earlier, but nowhere near that scale. I listened to a lot of music from Israel and Palestine as well as the music of Andalusia and the music of the Roma when I was writing my first, unpublished, novel. It really helped me with the writing mostly because it evoked those places for me and music was very much a part of the book. Of course, that also meant that the music wrote itself into the book in ways that were perhaps overdone. It needs a lot of – silent – revision! I don’t listen to music when I write now. I use it for dance like I said in that Poets & Writers online series, Writers Recommend where I talked about how I use music to get unstuck. Because dance is so much a part of my life, music gets under my skin and interferes rather than helps so I have found I can’t really listen to it and write at the same time. For me that is like trying to hold my breath and breathe underwater.